This week’s Junior School Spring Concert was a celebration of all of the hard work the pupils put into their performances at the Eskdale Festival. It showcases just how talented and confident our pupils are. Choral speaking, spoken verse, duologues, singing, flute, trumpet and piano playing were all featured, as every pupil took to the stage at some point during the afternoon. They clearly enjoyed performing in front of such an enthusiastic audience, so thank you to everyone who came. It was a truly memorable occasion and a testament to everyone’s hard work. Mrs Creighton-Lees, Y5/6 Teacher looks back at our participation in this special event. 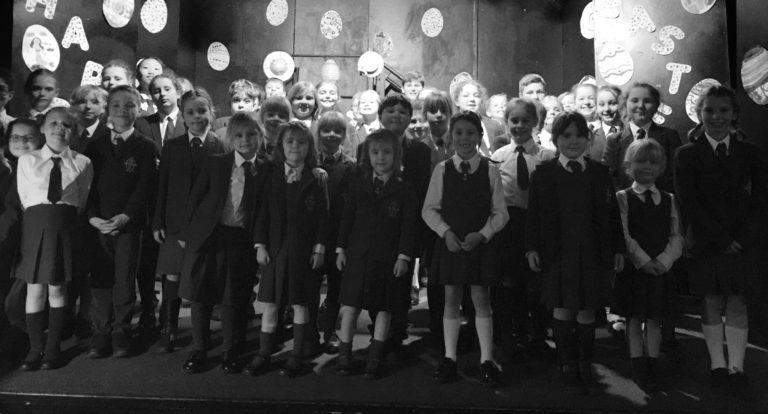 The Junior School had an extremely busy fortnight performing in the Eskdale Festival. This was my first year of being involved with this wonderful festival, just choosing the poems for the Choral Speaking was a challenge, never mind getting the children to remember their lines as well everybody knowing who was saying what! The Year 3/4 children performed ‘Heard it in the Playground’ by Allan Alberg, which was action-packed, keeping the audience entertained throughout. Whilst the Year 5/6 pupils performed the ‘Witches’ from Macbeth, this thought provoking poem really took the children out of their comfort zone, tackling difficult themes and language devices. Although a little stressful for the teachers at times, the pupils more than rose to the challenge and pulled out some memorable performances. Many of our children were performing for the first time and definitely rose to the occasion growing in confidence and are now ‘chomping at the bit’ to perform again. Alongside our group performances individual children participated in a variety of drama and musical performances: ranging from duologues, verse speaking, poetry composition, recorder, piano and flute to name but a few. The adjudicators were constructive in their feedback whilst striking up a wonderful rapport with the children, helping them relax and enjoy their performances. Many of the children are only just starting their musical journeys; whilst others are a little further on. We were invited back for the Gala Concert where Year 3/4 pupils performed one of their Choral Speaking poems; whilst the choir sang ‘Happy Together’ a firm favourite with the children, an upbeat number that certainly gets the foot tapping. As our children progress through the Junior School and beyond, they develop a range of skills, performance being one of them. It is important that we develop and nurture the whole child our pupils are the future. The festival is an important date in our school calendar, and we look forward to next year’s festival with baited breath.